Victor Oladipo #4 of the Indiana Pacers shoots the ball against Tim Hardaway Jr. #3 of the New York Knicks on October 31, 2018 at Madison Square Garden in New York City, New York. New York Knicks forward Lance Thomas (42), center Enes Kanter (00) and guard Trey Burke (23) defend against Indiana Pacers forward Domantas Sabonis (11) during the first half of an NBA basketball game Wednesday, Oct. 31, 2018, at Madison Square Garden in New York. Victor Oladipo #4 of the Indiana Pacers shoots the ball against the New York Knicks on October 31, 2018 at Madison Square Garden in New York City, New York. Indiana Pacers forward Bojan Bogdanovic (44) goes to the basket past New York Knicks guard Frank Ntilikina (11) during the first half of an NBA basketball game Wednesday, Oct. 31, 2018, at Madison Square Garden in New York. 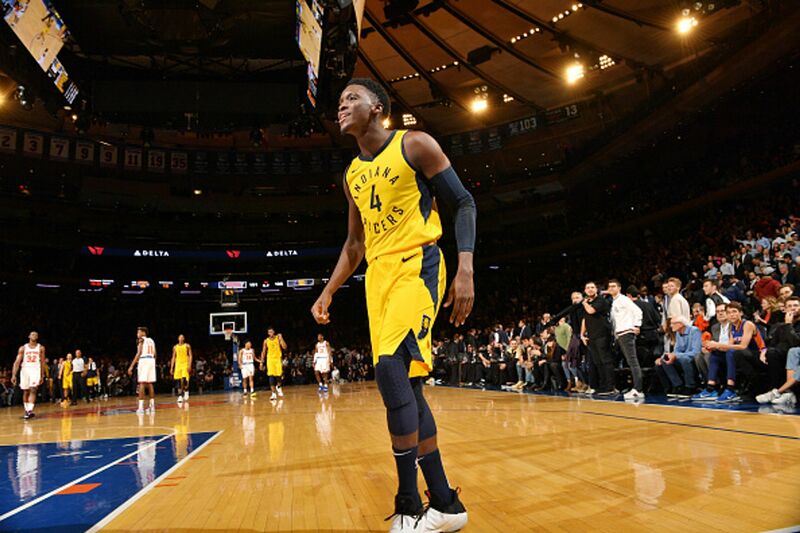 Victor Oladipo #4 of the Indiana Pacers reacts against the New York Knicks on October 31, 2018 at Madison Square Garden in New York City, New York. Indiana Pacers guard Darren Collison goes to the basket during the first half of the team's NBA basketball game against the New York Knicks, Wednesday, Oct. 31, 2018, at Madison Square Garden in New York. Indiana Pacers center Myles Turner (33) goes to the basket over New York Knicks center Enes Kanter during the first half of an NBA basketball game Wednesday, Oct. 31, 2018, at Madison Square Garden in New York. Indiana Pacers guard Tyreke Evans (12) goes to the basket against New York Knicks guard Allonzo Trier (14) during the first half of an NBA basketball game Wednesday, Oct. 31, 2018, at Madison Square Garden in New York. Indiana Pacers guard Cory Joseph, right, shoots as New York Knicks guard Allonzo Trier defends during the first half of an NBA basketball game Wednesday, Oct. 31, 2018, at Madison Square Garden in New York. Victor Oladipo #4 of the Indiana Pacers arrives to the arena prior to the game against the New York Knicks on October 31, 2018 at Madison Square Garden in New York City, New York. Myles Turner #33 of the Indiana Pacers arrives to the arena prior to the game against the New York Knicks on October 31, 2018 at Madison Square Garden in New York City, New York. The Indiana Pacers huddle up against the New York Knicks on October 31, 2018 at Madison Square Garden in New York City, New York. Frank Ntilikina #11 of the New York Knicks handles the ball against the Indiana Pacers on October 31, 2018 at Madison Square Garden in New York City, New York. Myles Turner #33 of the Indiana Pacers dunks the ball against the New York Knicks on October 31, 2018 at Madison Square Garden in New York City, New York. Domantas Sabonis #11 of the Indiana Pacers shoots the ball against the New York Knicks on October 31, 2018 at Madison Square Garden in New York City, New York.